Amongst bird-watchers throughout Europe the Maltese islands are notorious for only one thing-the widespread killing and trapping of protected bird species. While this reputation is deserved, it is also a great shame as the island holds so much potential for bird watching and conservation. I think less experienced birdwatchers and natural historians visiting Malta on holiday will not only find it very useful, but will enjoy it….For every species there is a section on identification and another on similar species, but there are also sections on habitat and conservation status. I like this. 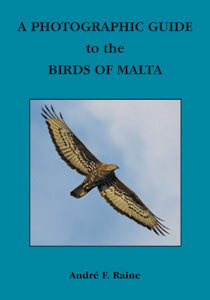 There are also introductory chapters on the islands of Malta, the habitats, the avifauna, top birding locations, conservation in Malta, and hunting and trapping in Malta.